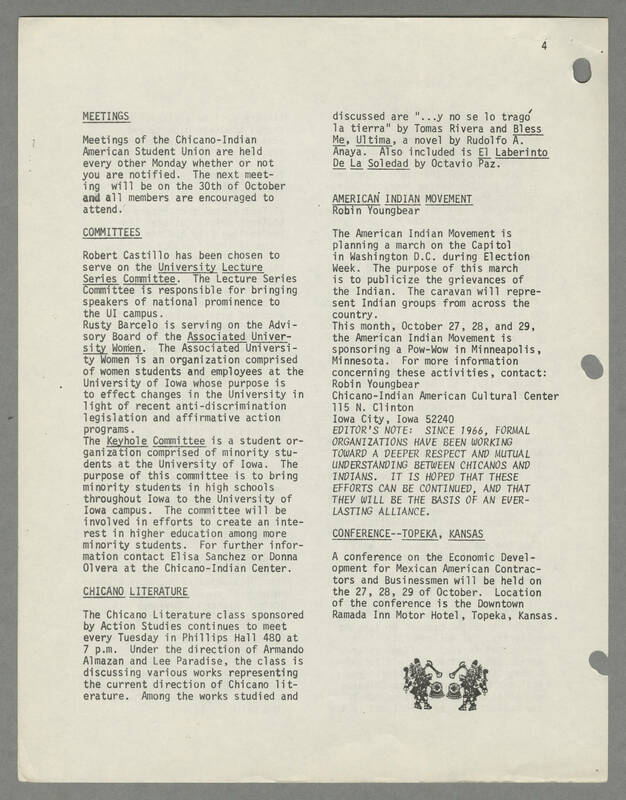 4 [[underline]]MEETINGS[[end underline]] Meetings of the Chicano-Indian American Student Union are held every other Monday whether or not you are notified. The next meeting will be on the 30th of October and all members are encouraged to attend. [[underline]]COMMITTEES[[end underline]] Robert Castillo has been chosen to serve on the [[underline]] University Lecture Series Committee[[end underline]]. The Lecture Series Committee is responsible for bringing speakers of national prominence to the UI campus. Rusty Barcelo is serving on the Advisory Board of the [[underline]]Associated University Women[[end underline]]. The Associated University Women is an organization comprised of women students and employees at the University of Iowa whose purpose is to effect changes in the University in light of recent anti-discrimination legislation and affirmative action programs. The [[underline]]Keyhole Committee[[end underline]] is a student organization comprised of minority students at the University of Iowa. The purpose of this committee is to bring minority students in high schools throughout Iowa to the University of Iowa campus. The committee will be involved in efforts to create an interest in higher education among more minority students. For further information contact Elisa Sanchez or Donna Olvera at the Chicano-Indian Center. [[underline]]CHICANO LITERATURE[[end underline]] The Chicano Literature class sponsored by Action Studies continues to meet every Tuesday in Phillips hall 480 at 7 p.m. Under the direction of Armando Almazan and Lee Paradise, the class is discussing various works representing the current direction of Chicano literature. Among the works studied and discussed are "...y no se lo grago la tierra" by Tomas Rivera and [[underline]]Bless Me, Ultima[[end underline]], a novel by Rudolfo A. Anaya. Also included is [[underline]]El Laberinto De La Soledad[[end underline]] by Octavio Paz. [[underline]]AMERICAN INDIAN MOVEMENT[[end underline]] Robin Youngbear The American Indian Movement is planning a march on the Capitol in Washington D.C. during Election Week. The purpose of this march is to publicize the grievances of the Indian. The caravan will represent Indian groups from across the country. This month, October 27, 28, and 29, the American Indian Movement is sponsoring a Pow-Wow in Minneapolis, Minnesota. For more information concerning these activities, contact: Robin Youngbear Chicano-Indian American Cultural Center 115 N. Clinton Iowa City, Iowa 52240 EDITOR'S NOTE: SINCE 1966, FORMAL ORGANIZATIONS HAVE BEEN WORKING TOWARD A DEEPER RESPECT AND MUTUAL UNDERSTANDING BETWEEN CHICANOS AND INDIANS. IT IS HOPED THAT THESE EFFORTS CAN BE CONTINUED, AND THAT THEY WILL BE THE BASIS OF AN EVER-LASTING ALLIANCE. [[underline]]CONFERENCE--TOPEKA, KANSAS[[end underline]] A conference on the Economic Development for Mexican American Contractors and Businessmen will be held on the 27, 28, 29 of October. Location of the conference is the Downtown Ramada Inn Motor Hotel, Topeka, Kansas.